Deploying Office 2010 Custom Ribbons and Settings via Group Policy. This post will detail the process of pushing UI changes out to your Office 2010 clients. It will cover default fonts, margins and changes to the ribbon. I couldn’t find a great deal of information on this subject when I first looked, so hopefully this will help those struggling to find a solution. Configurations made to the ribbon in Office 2010 are stored in .officeUI files, these aren’t created until you modify the default ribbon. Start with a vanilla office install and make the desired changes in the applications you use. 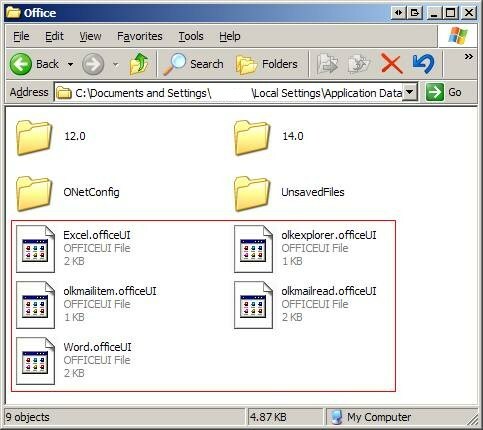 Once completed, head over to 'C:\Documents and Settings\%username%\Local Settings\Application Data\Microsoft\Office' where you should find the newly created .officeUI files. 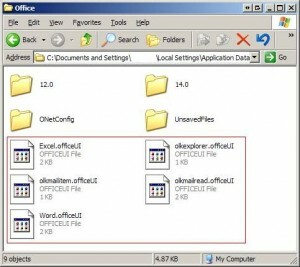 For a full list of officeui files and their descriptions click here (from Microsoft). For the purpose of deploying these changes via group policy you will want to copy these up to a share that as accessible to all users. These are stored in the normal.dotm (previously normal.dot in Office 2003). Open word and make your changes, close word and head to 'C:\Documents and Settings\%username%\Application Data\Microsoft\Templates'. There is one caveat with this, when you first open word it will rename the normal.dotm and create a new template. So you may want to separate the Word section of the script below and reapply the following day. For the purpose of deploying these changes via group policy you will want to copy normal.dotm up to a share that as accessible to all users. Excel and Outlook store the font and size settings in the registry. Make the changes in Outlook / Excel, close the application and open regedit and browse to the keys above. Right click ‘mailsetting’ or ‘Excel’ and select export, this will give you the .reg to import into other machines. For the purpose of deploying these changes via group policy you will want to copy the .reg files up to a share that as accessible to all users. Which brings us to the script to apply these modifications to a client machine. I would set this as a logon script. You can now customize your Office 2010 UI which is a great time saver if you deviate from the default. It would probably be easiest to just use the “%UserProfile%” system variable. If the Client machine already has a different customisation in place how do I merge the customisations or deploy the new one in such a way that Oulook applies the cusomtisation in addition to (rather than in place of) the existing olkexplorer.officeUI? There might be scope for appending to the original olkexplorer.officeUI, but it seems kind of messy from a quick play and will leave you with duplicate entries. This method seemed to work for me, but your mileage may vary depending on the content of your officeUI files. Let me know how you get on, or if you find a simpler method. Scripting the removal of the text above is probably going to be the hardest part with native Windows tools. I used the excel regedit example perfectly but there is one caveat. The MRU is brought into the users machines. I then cleared out my MRU and exported the new Reg key for Excel. Unfortunately everytime the users logon (I created a logon script via GP Preferences) their MRU is blank. How do I get their to begin rebuilding again?